Co-ordinator Greg Moody puts a record number of potential players through their paces at Monbulk Rangers Goalkick sessions. 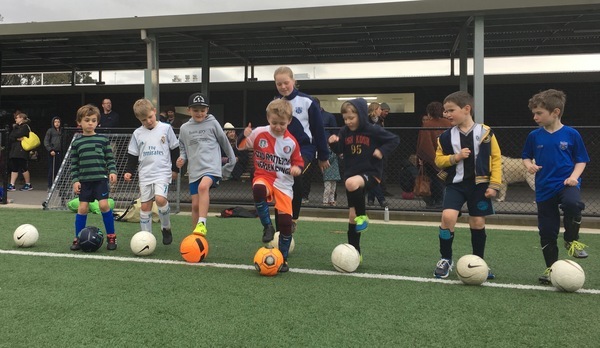 The future of Monbulk Rangers Soccer Club looks to be in good hands if the record numbers attending this season’s Goalkick program are any indication. Co-ordinator Greg Moody said a record 33 children aged from five to seven years registered for 10 weeks of Goalkick, with many expected to return to the club for the Summer Round Robin series starting in early October. Goalkick is designed to prepare the young players to enter competition in under-8 teams in 2019, with several Monbulk Rangers senior players teaching skills and drills to the youngsters. “This winter we started 35 players in four under-8 teams in the Victorian Churches Football Association (VCFA) competition and having done Goalkick in 2017, they were well-prepared for match play,” Moody said. The club registered 596 players this season and expects this number to grow again in next year as families flock to the new $10 million club complex with two synthetic pitches. The success of Monbulk’s senior men’s team will further boost its reputation, after they finished the season with an exciting 3-3 draw against Middle Park FC on Saturday 8 September, giving them a promotion to State League Division 2 next year. A large crowd turned out at the pitch to celebrate goalkeeper David Milne’s last game for the club and he didn’t disappoint, with a thrilling save in injury-time before being chaired off by his team mates.